Who does not love cake, but on a cold winters night or a frosty weekend I really feel like some real comfort. My Paleo Self-Saucing Chocolate pudding ticks all the boxes, indulgence and health. All the indulgence with none of the chocoholic guilt. 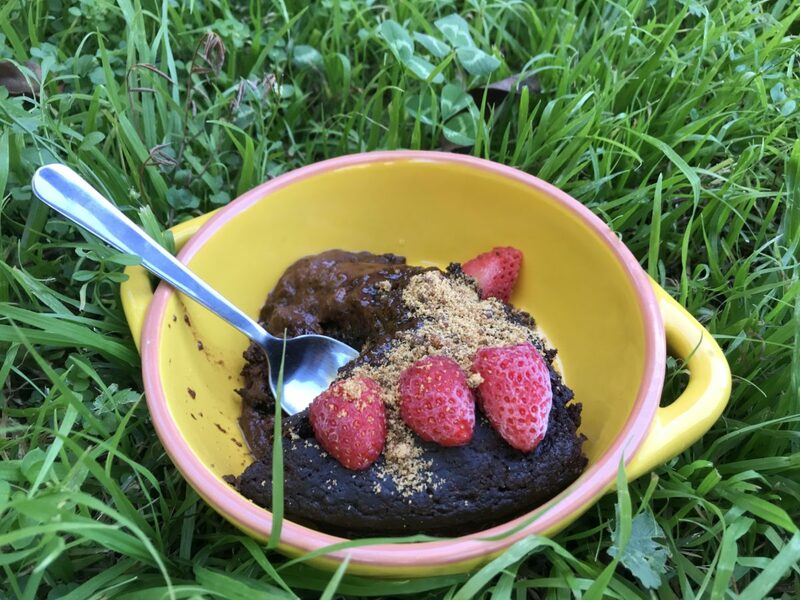 What more could a cold tummy want; Chocolate, healthy, Paleo, low-sugar, pudding, delicious. I do not eat dessert very often and my body and gut health are really important to me. So when I have that moment of need for something a little indulgent this is perfect. This healthy treat has the most delicious, light and moist texture with incredible nutrition. Preheat Oven to 170 degC. Put aside a 20cm Ramekin or round glass dish. Add all Pudding ingredients, except for the apple cider vinegar into a mixer or processor and mix until well combined. Allow to rest 5 minutes. In a bowl combine all sauce ingredients together and whisk until all is well dissolved. Add Apple Cider Vinegar to the rested pudding mixture and beat in well. Pour the pudding mixture into the ramekin and spread so the top is level. Gently pour the sauce over the pudding mixture, being careful not the disturb. TIP: Pouring over the back of the desert spoon makes for a gentle pour. Place the pudding into your oven and bake for 35 to 40 minutes or until a skewer that peirces the centue comes out mostly clean. Remove from the oven and rest for at least 10 minutest to cool slightly. Serve warm as is or with a dash of cashew cream. Enjoy!